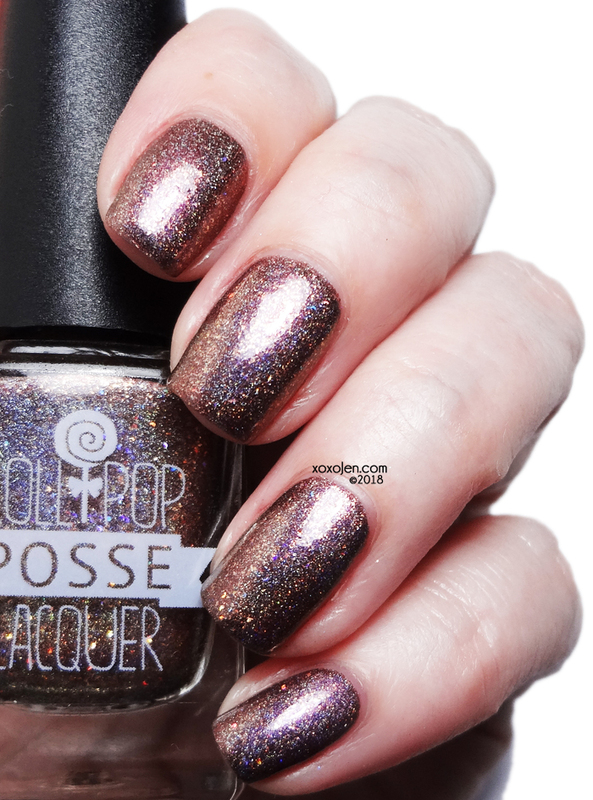 Join Lollipop Posse Lacquer as they bring you a small taste of those little things that just don’t go according to plan during the holidays. What would the season be without a little bit of snark and chaos? Release Date and Time: Thursday, November 22nd, 9pm Central. Eleven Cookies in the VCR is a strawberry-bubblegum pink crelly loaded with red to green shifting Aurora pigment and holo flakes. The bottle shot shows the green shift really well, this does translate to the nail but my bottle shot illustrates it much better than I could with my nail shots. 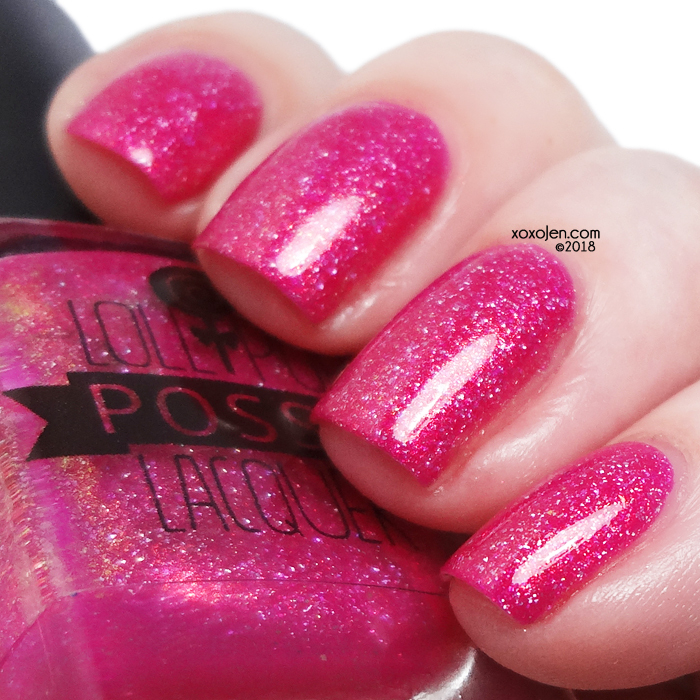 I tend to be a little iffy about pinks, but this one is bright and pretty and the shifting shimmer sells it to me. 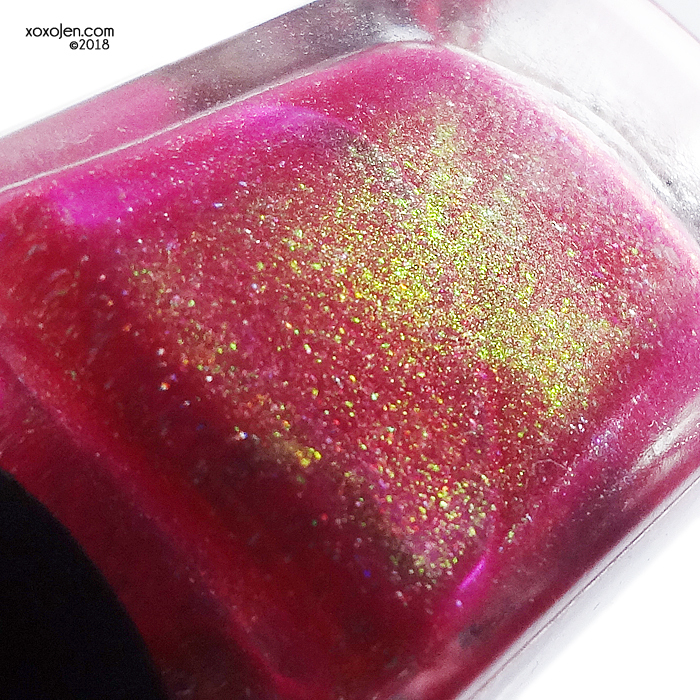 Full-Blown, Four-Alarm Holiday Emergency is a grape crelly packed full with red/pink/gold shifting Aurora pigment and holo flakes. 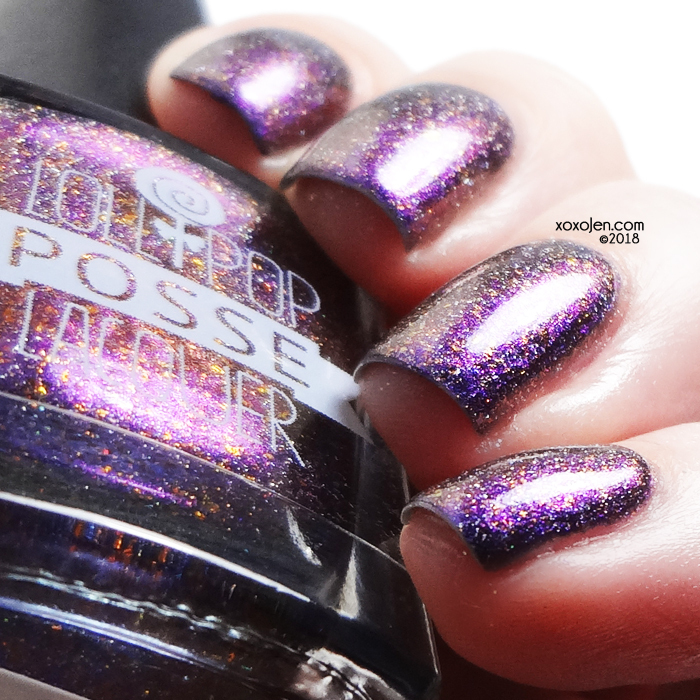 The perfect purple with super vibrant contrasting shimmer and holo all bottled up just for us! When I first put this on I was wowed by it. 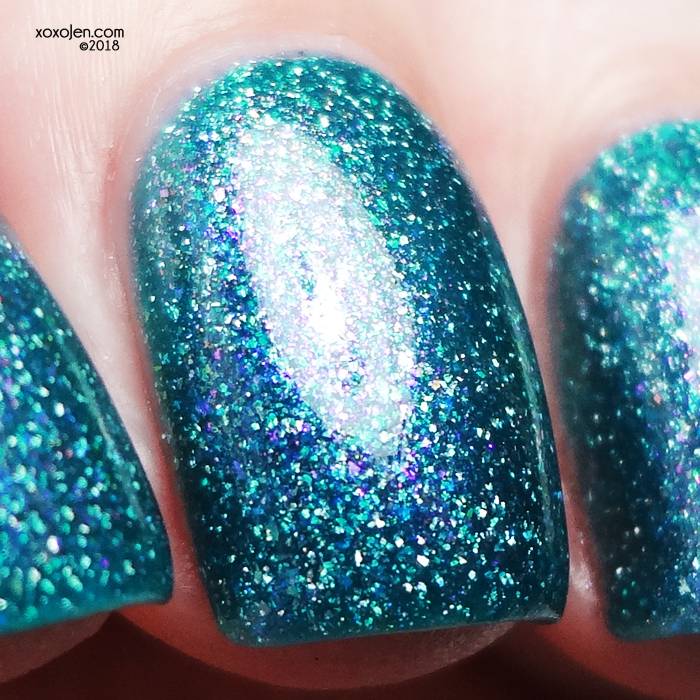 Seasonal Garbage is a blue-leaning teal crelly base packed full of purple/copper/green shifting Aurora shimmer and holo flakes. Another done in the same vein as the others above and I love it just as much, cause teal. Welcome to the Party, Pal is an electric, ultramarine blue crelly base filled with cyan/indigo shifting Aurora shimmer and holo flakes. 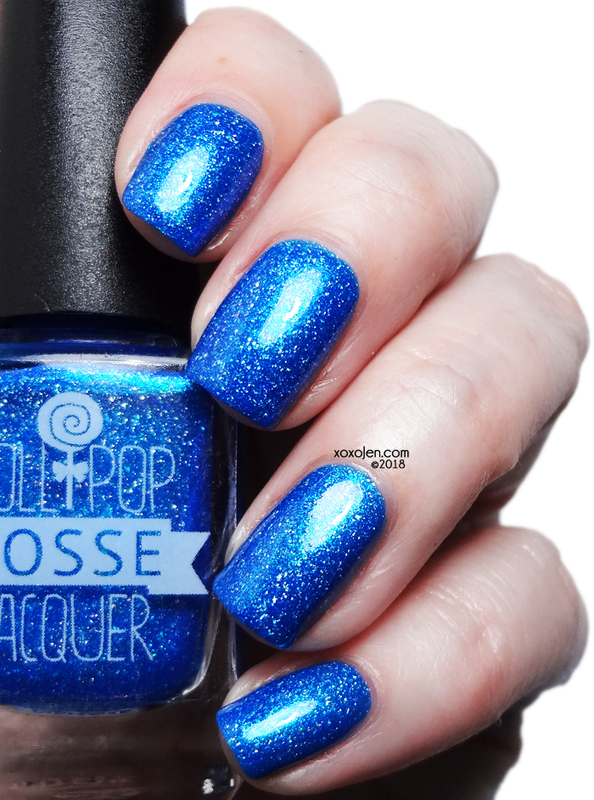 And the last sister, only a super vibrant blue this time. Yes, I love this one too! 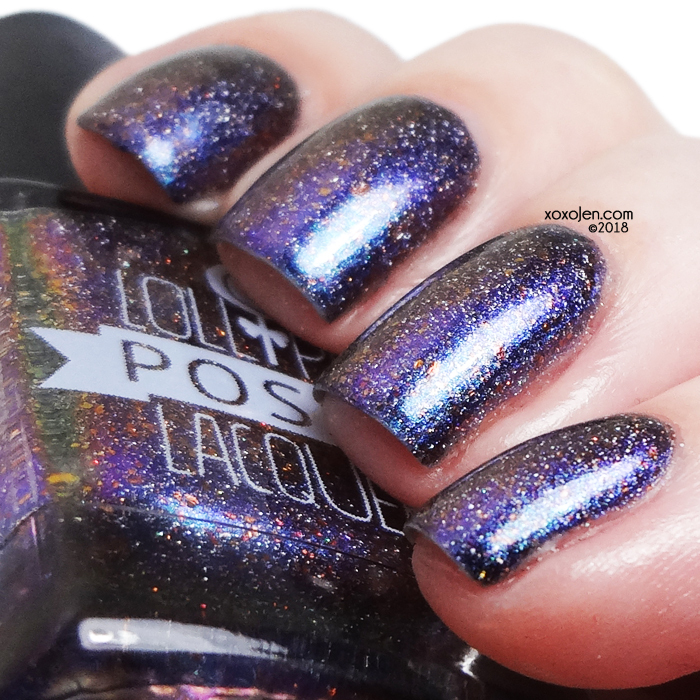 A Thrill of Hope is a blackened indigo creme base scattered with holographic microflakes and purple flakie and microglitter accents. One Coat shown. Don't miss this one, ya'll! 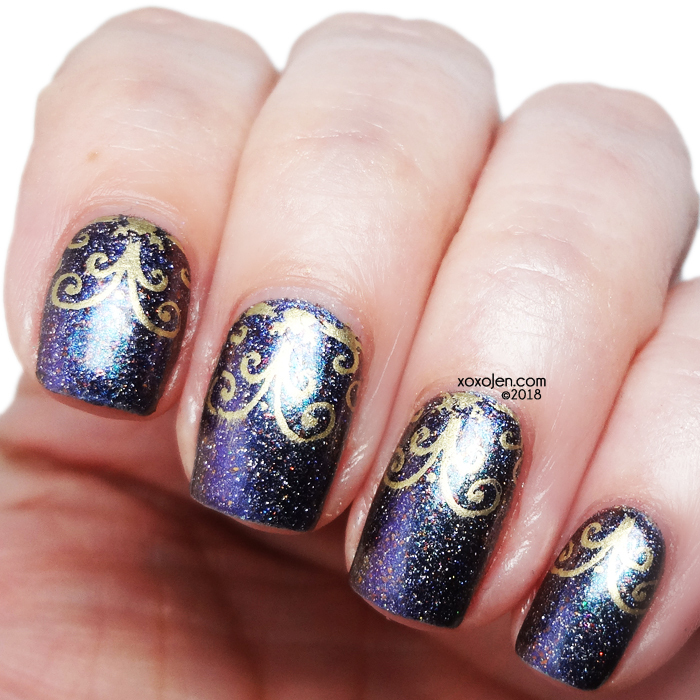 As in Olden Days is a darkened blue to purple shifting multichrome, accented with silver holographic flakies, bronze microflakes, and scattered holographic pigment. This has a vibrant teal shift that isn't mentioned above and I managed to capture it to share with ya'll. Very pretty and vampy. Stamped with Hit The Bottle Spun Gold. Fancy! 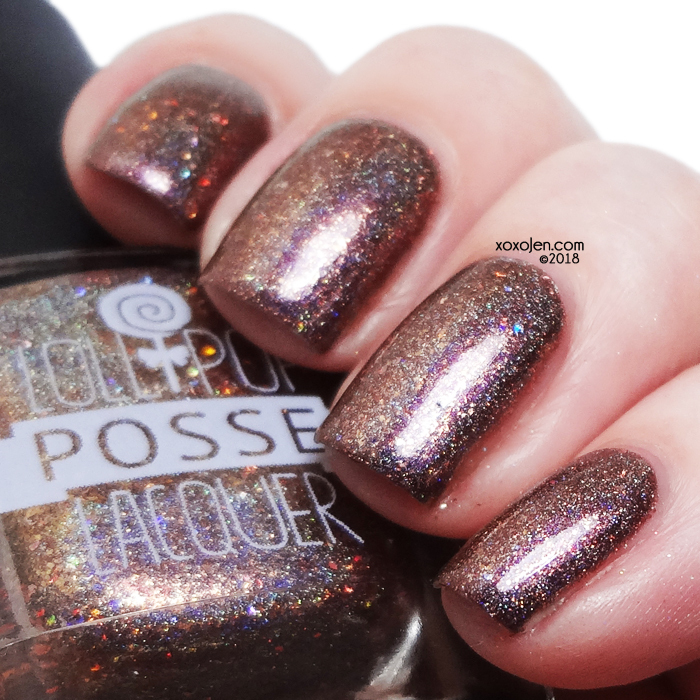 Chestnuts Roasting is a brown-based metallic multichrome filled with bronze microflakes and holographic accents. Topcoat required for a smooth finish. 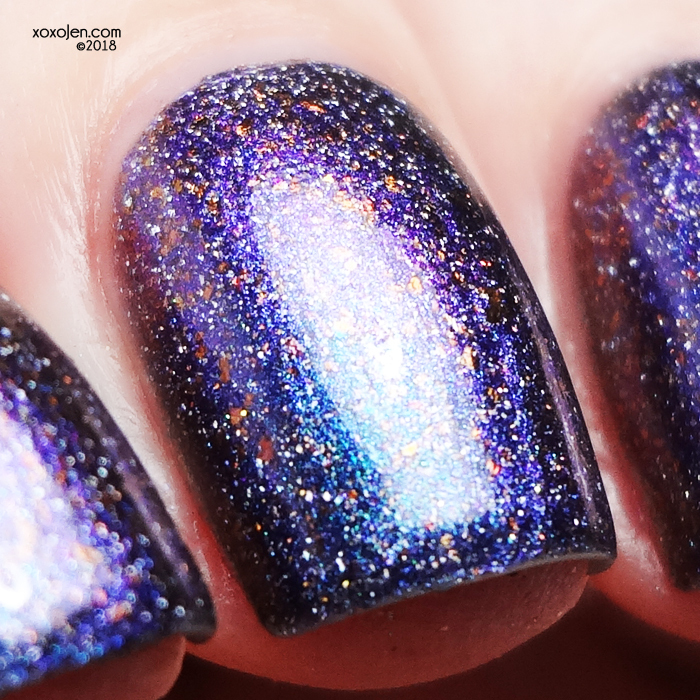 I'm still wearing this one, the sparkle and holo are intense! Whiskers on Kittens is a rose-gold base filled with gold flakes, bronze microflakes, pink holographic shreds, and holographic accents. Topcoat required for a smooth finish. 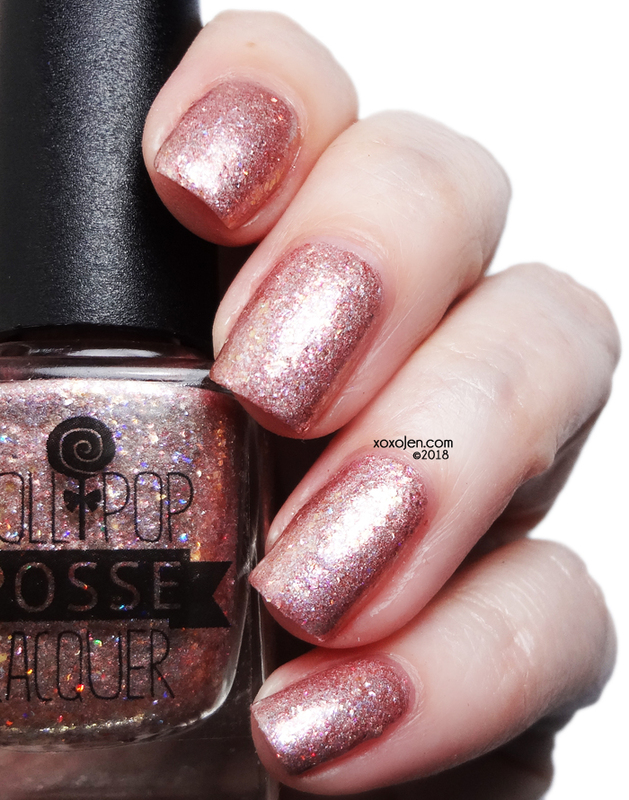 The flakes make for a metallic finish and the rosegold shade is soft, together they're edgy yet girly. 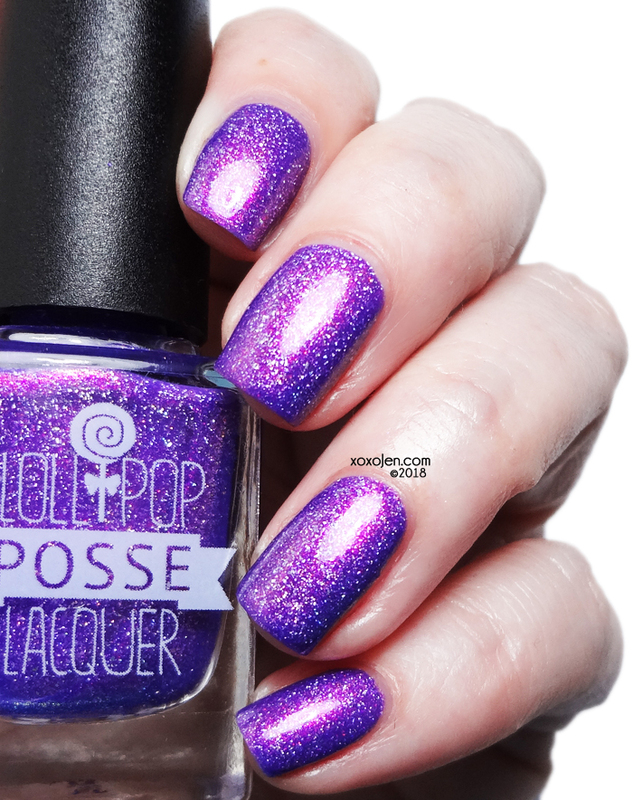 Releasing at Lollipop Posse Lacquer November 22nd, 9pm Central. Everything will be sold on a ready to ship (RTS) basis. If any of the shades from the Seasonal Garbage collection sell out, those will be set to a pre-order; everything else will be limited to what is on hand. All RTS stock will have up to a 14 business day turn around time, plus ship time. Half price outside USA (international) shipping for purchases over $45. No code needed; half of international shipping costs will be refunded within 3 business days of purchase. All Those Martini Olives will be available exclusively as a free gift with any $45+ (before shipping) purchase! 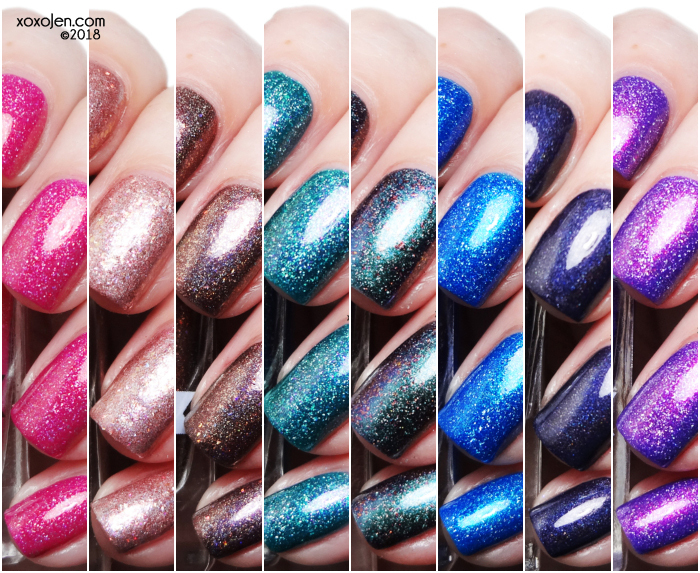 All Those Martini Olives is a hunter green crelly filled with red/green multichrome shimmer and holographic copper accents. No code needed! It will automatically be added if your order qualifies.